Showers continue around metro early this morning - above is composite radar at 05:10 am MST on the last day of 2016. The ALERT network seems to be functioning now, and I've broken the new display into a north and a south portion to show rainfall through 05:00 am. Overnight measurable rain has occurred over 100 % of the ALERT area and also the Tucson metro region. Amounts at low elevations generally a tenth to a third of an inch so far (0.27" here at house), but with much higher amounts over and around the Catalinas and Rincons. This first event has been mostly rain, even at high elevations. The WRF forecasts from atmo indicate continued chances today for light showers around the region, followed by the second colder and again widespread event tomorrow. Significant snowfall forecast at high elevations of the Sky Islands tomorrow, with much cooler temperatures at low elevations. Definitely a nice transition to 2017 for weather watchers. First, a look at yesterday's east winds. The WRF-GFS forecast from Atmo yesterday morning was quite good wrt the gusty east winds - which continued at the airport into the early morning hours today. Plot above shows observed wind time-series at airport (blue), with gusts indicated by the black dots. Max gust at airport was 33 mph; DM 31 mph; and Mt. Hopkins 42 mph. The 06 UTC GEFS TUS plumes for QPF, above, are interesting for several reasons. The timing for the New Year's Day event has shifted into the daytime hours. The GEFS models continue to forecast 100 % probability at the airport for both tonight and New Year's Day - but that POP is only for at least 0.01". Even though the plumes are clustered tightly in time, there is still considerable spread in amounts of precipitation forecast by the ensemble members, especially on New Year's Day (range of amounts is from 0.40 to 1.00 inches). The past three mornings the operational GFS operational version (blue) of the model has been very inconsistent, going from driest, to close to average (black), to wettest now. Current NWS morning forecast today is shown below for the airport grid. Even though the operational GFS has become wettest forecast, the WRF-GFS high resolution, QPF forecast has decreased substantially during the past 24-hours. Forecast above is for total precipitation through 07:00 am MST on January 2nd. 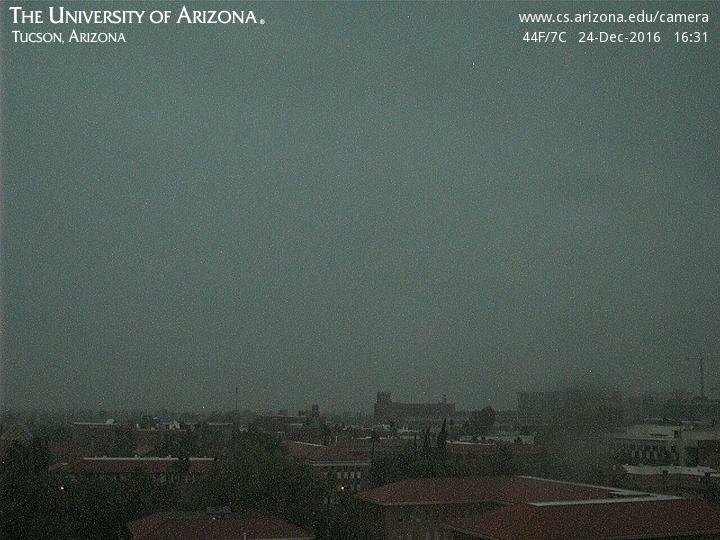 Heaviest amounts are now forecast for the Rim Country and for the Sky Islands. Decrease in forecast amounts at low elevations in eastern Pima County since yesterday are mostly due to the closed low off the west coast taking a more northerly track across Arizona tonight. The SREF plumes from SPC include a nice graphic that shows the change in the average QPF amount from the 26 members as a function of changing forecast initialization times (a sort of dprog/dt). This graphic is shown below (at TUS) for the last four initialization times - red 29/15 UTC; purple 29/21 UTC; green 30/03 UTC; and blue 30/09 UTC. The first two runs were fairly consistent (the grid lines are at 0.10" intervals); however, the models have become more inconsistent as the event nears. The 03 UTC forecast today was much drier than the first two runs, but then the current 09 UTC run becomes much wetter for the New Year's Day event. A nice illustration of two things here: QPF remains very difficult; and the models can have considerable inconsistency even at short time ranges. So, we will have to wait to see what the New Years brings. More interesting weather going on than I can show with my late start this morning. High pressure of about 1038 mb over eastern New Mexico today will bring east winds to our part of Arizona later today. The WRF-GFS at 06 UTC forecasts a period of gusty winds of 25 to 35 mph at the airport this afternoon. The issue of how the winds will play out depends upon both the easterly pressure gradient and the heavy cloud cover - the two are essentially fighting each other. Forecast soundings indicate a fairly shallow layer of strong winds that would affect parts of the metro area. Up at the Mt. Hopkins RAWS site, the the easterly push may be just deep enough to bring a marginal wind event of say around 45 mph later today. On to the precipitation events. The 06 UTC GEFS plumes have become much more consistent since yesterday morning (QPF plumes for TUS at the top). The models in the ensemble are consistent now in time - light sprinkle showers today; then tomorrow night the models forecast 100 % chance for measurable rain at the airport; followed by a more significant 100 % event from late night on New Year's Eve through midday on the 1st of January. The operational GFS is now very close to the ensemble mean, and thus Atmo's WRF-GFS forecasts from 06 UTC are of much interest. Currently the NWS seems to have covered all this with a broad brush, as per the current grid forecast for the airport below, with max POPs of only 50% for three different periods. However, if the forecasts from Atmo come close to verifying, then we are in store for a fairly significant precipitation event over the long Holiday weekend. Here are two composite radar forecasts from the 06 UTC WRF-GFS - above is valid at 01:00 am MST on the 31st and below is valid at 06:00 am on January 1st. While here are two forecasts for total precipitation from the model run last night. Above is valid through 05:00 am on December 31st, while below is valid through 11:00 am on New Year's Day. This would certainly be an interesting end of the year, if the model forecasts are close to reality. Bottom panel is forecast surface plot for 07:00 am on News Year's Day - a wet and very chilly start for next year. 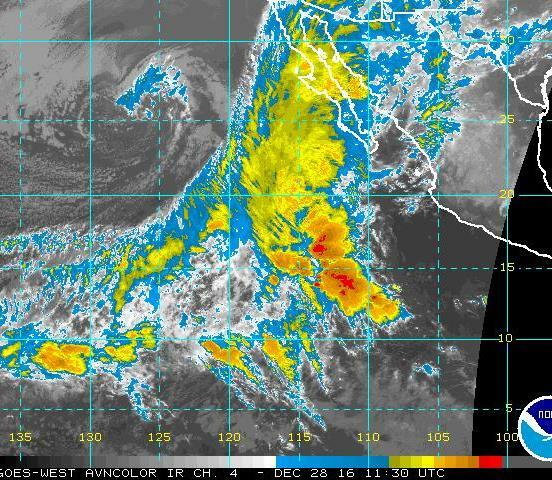 The meandering, 500 mb closed-low west of Baja is providing low-latitude interest, as a broad plume of tropical moisture spreads northward, centered about 115 degrees W. The IR image above is from 1130 UTC this morning, and the MIMIC blended PW analysis below is from 1100 UTC. Values of PW of an inch or more have reached northward up the GoC to about 30 degrees N. A key forecast issue for the next few days will be how far into the Southwest this moisture plume might intrude. Currently, model forecasts are very mixed. The GEFS plumes illustrate the high uncertainty at this time. The 06 UTC plumes for QPF at TUS (above) have a variety of forecasts (amounts and timing) depending upon the member model run. The operational version of the GFS is a serious DRY outlier wrt the ensembles, and I have not paid much attention to the WRF forecasts, which are driven by this very dry model forecast. The operational ECMWF appears considerably more wet. The plumes for PW (below) spread all over the place beginning on the 1st of the New Year, and this is part of the reason that the various ensemble members go different directions - some versions bring the higher moisture into our area and others don't. Another wait and see what the weekend actually brings situation. 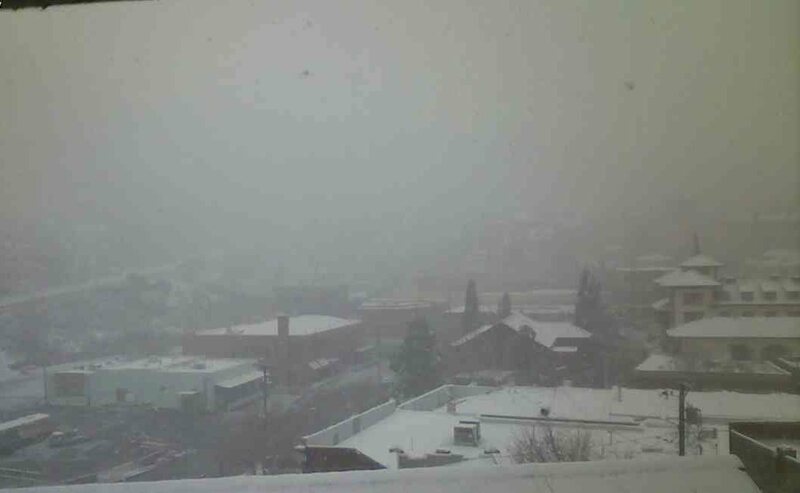 The models do indicate that the first week of 2017 will be quite cold for a large part of the continental U.S.
Webcam view of Bisbee above (snow was pretty general at locales east of Tucson where elevations are a bit higher) but time is unknown. 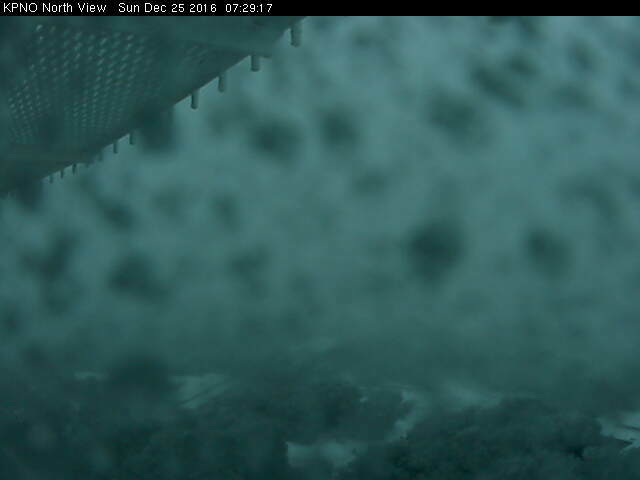 Kitt Peak was hard hit with snow and wind - view below from this morning. I saw one weather station on Kitt Peak measured winds of 70 mph yesterday afternoon as front approached. Hope everyone who stops here has a great Holiday. Snow - How Low Will It Go? The toughest forecast issue this morning is that of how low the snow level will fall early tonight, and whether parts of metro will see some Christmas Eve flakes. I've looked at the SREF plumes from SPC, mainly because the GEFS plumes basically go for just rain at the airport, and there's more detail and spread available from the SREF's 26 members. Plot above shows total QPF at TUS, while plot below shows total snowfall at the airport. Looks like about half the members forecast at least a few flakes at the airport. I've looked at the 06 UTC WRF forecasts for the evolution of the soundings at TWC and don't see a very great signal for wetbulbing. During the late afternoon and early evening, the depth of vertical motion is good for developing at least moderate precipitation, but low-levels are too warm for much wetbulbing. Later, around 08:00 to 10:00 pm, the near surface becomes very favorable for wetbulbing, but the depth of saturated layer becomes shallow and doesn't appear favorable for good snow growth. My cloud physics background is not very good, but I don't find signals in the WRF forecasts that would make me go for snow at airport. Although, obviously, some of the SREF soundings must forecast more favorable structures. Another watch and see what actually happens situation. The 06 UTC runs of the WRF don't have snow turned on, but the 00 UTC run of the WRF-GFS does. The forecast below is from that run and shows total snowfall through 06:00 am MST tomorrow morning. That forecast keeps snow out of the metro. The model forecasts a significant event for the Baboquivari Mountains and Kitt Peak, as well as for our three local Sky Islands. If this forecast verifies things could become a bit dicey during the night on I-10 toward Benson and Texas Canyon, and also on Highway 83 south toward Sonoita. I've been thinking a bit about where there might be interesting photo ops as this event unfolds. Best place to watch the front roar in might be Kitt Peak - open today but closed tomorrow. Current forecast shown on their website doesn't mention snow. Gates Pass might be another possibility, with good views of the approaching front. 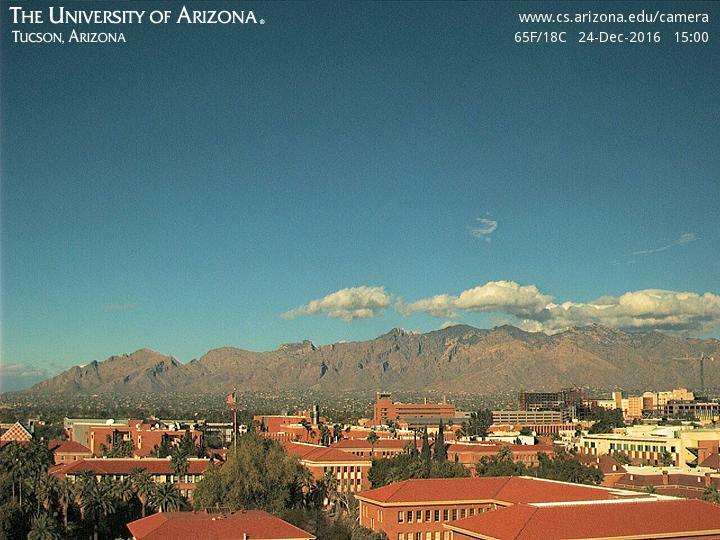 Mountains, saguaros, and snow cover should be easy tomorrow morning around the fringes of the Sky Islands. Oracle, Madera Canyon, and also the Greaterville/Box Canyon Road should be interesting right after sunrise. But, Saguaro NP East has much easier access. Regardless, we have a very interesting Christmas weekend on tap. Have a great Holiday. 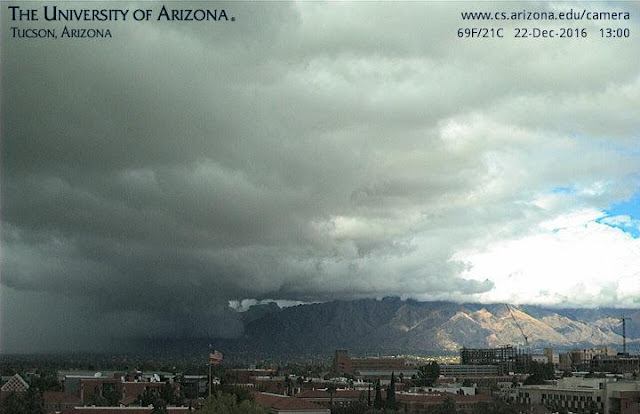 Wall Cloud West End Of Catalinas? Photo above from Mike Leuthold yesterday at around 01:00 pm MST. There was some discussion among local weather watchers as to whether this might have been a wall cloud - a feature often associated with severe thunderstorms with rotation. It was certainly something to watch, but there did not appear to be rotation. There were definitely thunderstorms occurring - below is CG flash density for 24-hours ending at 07:00 am this morning. 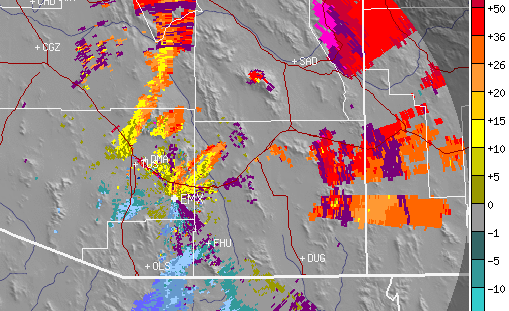 Radar (base scan at 01:00 pm) above shows the line of strong echoes from I-10 north to west side of the mountains. The Doppler velocity at the same time (below) indicates radial velocities were all outbound - note that the height of the 1st tilt is well above what is shown in the photo at top. But there was probably not a deep updraft with rotation present. Photo at bottom was taken by Art Rangno looking south from Catalina before the storms got to the mountains. There was a very pronounced shelf cloud leading the storms and it had a very low cloud base. 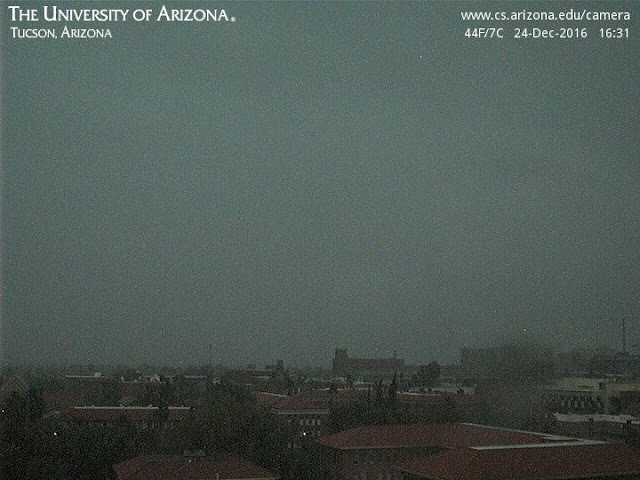 So my guess about all this is that the photo at top shows the shelf cloud impinging onto the mountain. See Art's post about this event up where he was - link to right. 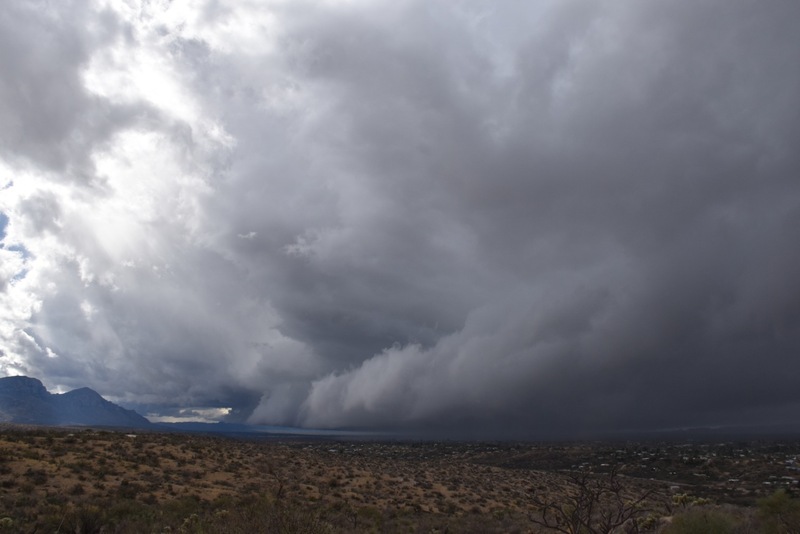 A strong line of thunderstorms plowed into the northwest metro and west side of the Catalinas around 01:00 pm MST yesterday afternoon. The storms were visually spectacular and also dropped rain amounts of a half inch and more in less than an hour. Although there seem to be continuing problems with the ALERT network, the plot below (24-hour rainfall ending at 07:00 am this morning) gives a feel for the line of storms in the reports of more than half an inch from I-10 north-northeastward to Oracle. Here at house the entire 36-hour event produced only 0.32". I may try to do a separate post on the thunderstorms later today. The event for tomorrow is rapidly approaching - Christmas Eve evening will not be the time to be touring the Winterhaven festival of lights. The GEFS plumes for rainfall at the airport are shown above - note that the operational run at 06 UTC was the wettest version of the model. The SREF plumes from SPC are shown below, and they provide a bit higher time resolution wrt the possiblities of onset and ending times. The plot is scaled at 0.10" and only two of the members forecast a bit over half an inch, with the average being drier than the GEFS forecasts. The hourly grid point forecasts for the airport (above) indicate an abrupt frontal passage during the early afternoon, with temperatures dropping into the 40s, along with strong winds, during the late afternoon. The 10-m wind forecast below is from the 06 UTC WRF-GFS, showing very strong per-frontal winds, as well as the abrupt wind shift line. Last minute errands tomorrow would go most comfortably if done in the morning and midday hours, before things deteriorate into a nasty afternoon. With the snow level dropping very low, there could be some nice opportunities for "snow in the desert" photography early on Christmas morning. Not much to do now except try to keep dry. 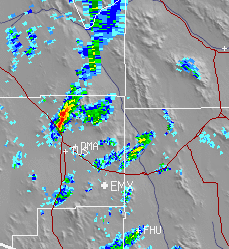 More showers moving across metro at 06:30 am MST - composite radar above. There was 0.29" in gauge here at 05:00 am - first event with quarter inch or more since September 7th, so very welcome. Appears that most of the nighttime rain fell before midnight. The GEFS QPF plumes from 06 UTC (below) for TUS are tightly clustered now for today and then again for Christmas Eve. Only a couple of members now forecast snow at airport during second event - so close for metro, but some white for slightly higher areas around the fringes of the city. This list is by County for southeast Arizona, and shows 100% widespread event but with large range in amounts of precipitation - another mostly rain event up on the Sky Islands. The Pima County ALERT information on their website continues to have serious problems, but the data are apparently available for those with direct access, as per the NWS. Back on December 10th I posted a 15-day forecast from the operational GFS that showed total precipitation through 05:00 pm MST on Christmas Day. The model forecast way back then certainly had the right trend, with the closed low and tropical moisture plume affecting the Southwest. It was a few days slow and didn't reflect the Christmas weekend storm coming down from the Northwest - but not bad for so far out. Forecast below is from the 06 UTC WRF-GFS last night and is for total precipitation through midday Christmas Eve - quite a pair of events if this forecast verifies. Big question now becomes how low will snow level drop during the night before Christmas? Edited to add: Relative to the question just above, I added the 06 UTC GEFS plumes for QPF and also for snow accumulation at the airport. Some ensemble members are actually forecasting snow down at low elevations across the metro. Light showers and astronomical winter began about the same time early this morning. Showers developed sooner than expected, as PW increased during the night to values of an inch or a bit more across southern Arizona. The airport has had 0.06" so far, and here at house it looks like about 0.03" - just enough to wet the streets and dampen things up. The composite radar map above is from a bit before 05:30 am MST and the NWS updated forecast for TUS is shown below - looks very unsettled through Christmas. How Many PhDs To Write A Paper?